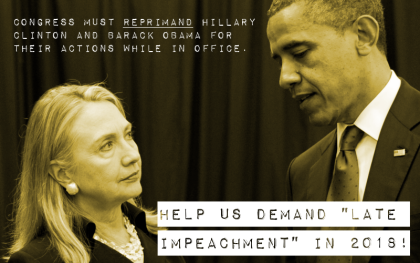 "Tell Congress to pursue LATE IMPEACHMENT for Hillary Clinton & Barack Obama!" It's time for Congress to impeach Hillary Clinton and Barack Obama for their illegal acts while sitting as officers of the United States. You read that right: It's time to IMPEACH Clinton and Obama for their crimes! Despite what you may have heard, former elected offical remain subject to impeachment for their official actions after they have left office. In fact, Congress pursued "late impeachment" successfully in the late 19th century. As John Quincy Adams famously said: "Every officer impeachable by the laws of the country, is as liable, twenty years after his office has expired, as he is whilst he continues in office." In light of former Secretary of State Hillary Clinton's criminal email scandal and the new revelations that then-President Barack Obama was involved, it's time for Congress to hold them accountable! Take action now and demand your U.S. Representive and Senators to pursue late impeachment to reprimand Hillary Clinton and Barack Obama for their official crimes!